If you’re looking for an adventure this summer that’s relatively close to home, but not too close, you’re in the right part of the world. The Midwest is chock full of getaways that offer a variety of things you like to do: eat, drink, exercise and explore. Whether you need family-friendly excursions, a place for friends to catch up or a romantic rendezvous, these five nearby locations can accommodate your summer plans. If you’re looking for an outdoorsy getaway, you might consider Door County. 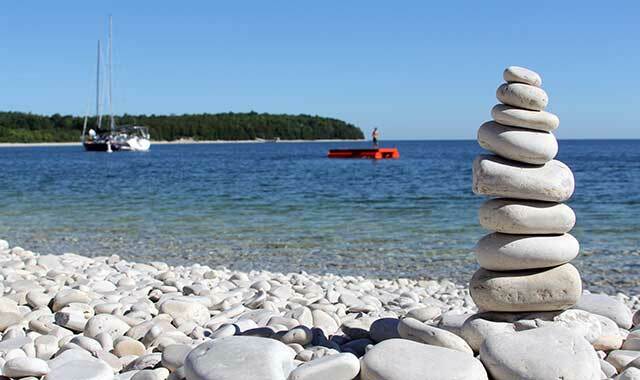 With five state parks and 19 county parks – almost all of them touching the water – you’ve “definitely got to get outside,” says Jon Jarosh, director of communications and public relations for Door County Visitor Bureau. You can hike, bike or simply check out the view from a scenic vista. Door County is located on a 70-mile-long peninsula between Green Bay and Lake Michigan. Given its 300 miles of shoreline, it’s hard not to suggest time at the beach, and there are 53 public beaches to choose from, Jarosh says. “You can find big beaches, busy beaches, remote beaches – it’s all over the board,” he says. Door County is also made up of 34 named islands, including Washington Island, which is the area’s only island with a year-round population – about 700 people total. To get there, it takes a 30-minute ferry ride through Death’s Door, the strait linking Lake Michigan with Green Bay and known for its treacherous waters and shipwrecks. The journey is worth it, as several attractions await, including two lavender farms, Schoolhouse Beach and the well-known Sievers School of Fiber Arts. The arts and culture scene is thriving in the communities of Door County. There are nearly 100 galleries and studios throughout the peninsula, and they showcase artists who work in many mediums, Jarosh says. Halfway up the peninsula resides the bayside Peninsula Players Theater, the oldest summer resident professional theater. Northern Sky Theater features original musical comedies for the whole family; Door Shakespeare offers outdoor Shakespeare performances; Third Avenue Playhouse presents a variety of plays and musicals; and Birch Creek Music Performance Center offers summer concerts. If you happen to visit between Aug. 1 and Aug. 19, check out the Peninsula Music Festival, which invites musicians from around the country to perform. Otherwise, most places offer free afternoon or evening concerts, Jarosh says. “I think you can get a community concert free on five or six days of the week up here during the summer season,” he says. Finally, you can’t leave Door County without attending a Door County fish boil, which Jarosh says is more like a party than a meal. A “boil master” serves up stories with whitefish, potatoes, onions, coleslaw, rye bread and a piece of Door County’s famous cherry pie. Tour one of Door County’s 11 historic lighthouses, four of which are open to the public through October. Enjoy a docent-guided tour or climb to the top for majestic views of the surrounding coastline. There are eight wineries to visit on the Door County Wine Trail, and each offers daily tastings; some offer special winery tours. The U.S. has had only 45 presidents in its history, so there aren’t many presidential homes to tour. That’s why, when you visit Galena, the first stop on your list should be the home of Ulysses S. Grant, the country’s 18th president, who served from 1869 to 1877. His Italianate home was gifted to him by Galena residents in 1865 and is a historical site for a number of reasons, including its original furnishings, says Katherine Walker, director of the Galena/Jo Daviess County Convention and Visitor’s Bureau. Your second stop should be downtown Galena, Walker says. 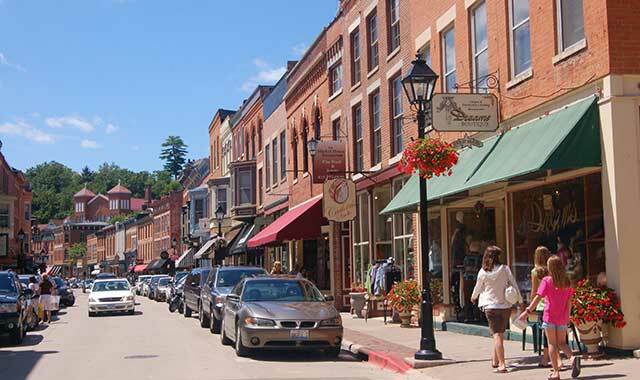 Founded in 1826 as a lead mining town, Galena was a thriving community by 1858. Though the city’s economic drivers have changed, Galena’s downtown area hasn’t. That means there’s plenty of history to see as you walk around downtown, simply by studying architecture. One stop to make is at the 1897 blacksmith shop where blacksmiths tell the tales of an era gone by while using the working forges to create items available for sale. Within town, there’s plenty of shopping to do, with gift shops, antique shops, boutiques, spas and salons lining the streets. But just outside town lies more adventure. While most of Illinois is flat as a pancake, Galena lies in the state’s Driftless Area, famous for its rolling hills that overlook the Mississippi River. One way to see the Mississippi is to take a river cruise from Chestnut Mountain, the only ski resort in Illinois. The 1.5-hour pontoon ride is narrated with a good deal of information about the natural area. Two tour companies offer one-hour trolley tours of Galena. It’s a great overview of the destination and its history. Two brothers who wanted to create unique experiences and products founded this distillery. They offer whiskey, vodka, gin and seasonal spirits for sale, plus tours of the production facility. 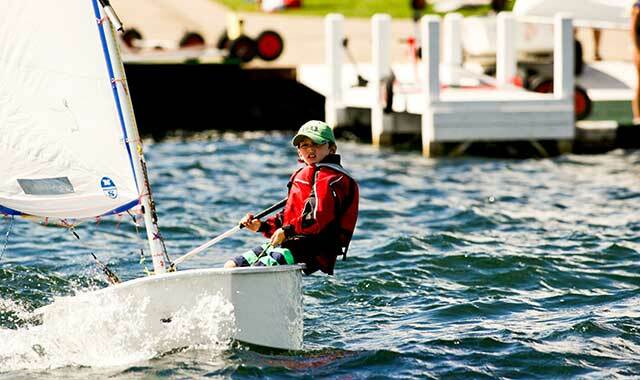 With Wisconsin’s deepest natural inland lake as its namesake, it’s obvious why so much recreation revolves around Green Lake’s 7,920-acre body of water. With seven launches available on the lake, it’s easy to get a boat, Jet Ski, canoe or kayak for a great day of fishing, leisure rides or paddles. Swimming is popular, too, whether from the back of a boat or on one of the city’s public beaches. If you’d rather stay on land, Green Lake offers a variety of biking and hiking trails. The 27-mile “Loop the Lake” bike route follows the perimeter of the lake, while 11 miles of the Mascoutin Valley State Park Trail, which follows an old Milwaukee rail bed, run through the Green Lake area. There are a number of short public hiking trails, too: Hammers Trail features five bridges; Winnebago Trail Conservancy is a former Native American trail; and Sunnyside Conservancy Trail combines woods with the scenery of the County K Estuary. Green Lake is also home to Wisconsin’s oldest golf course, Tuscumbia Country Club. This 27-hole, 6,301-yard, par-71 public course sits in a park-like setting, with a log clubhouse boasting a rustic fireplace and charming decor. Tuscumbia Country Club is only one of four major courses in the Green Lake Country area, which encompasses Green Lake, Ripon, Berlin, Princeton and Markesan, Walsh says. The Golf Courses of Lawsonia, Mascoutin Golf Club and White Lake Golf Resort all are within 30 minutes of Green Lake. “It’s a golfer paradise here,” she says. After a day of exercise, Walsh suggests dining at Norton’s of Green Lake. The traditional supper club – which still has its neon sign from days of old – sits right on the water and serves up breathtaking views. The restaurant opened in 1948 and is known for its fish chowder, Canadian walleye dinner and strawberry shaum torte dessert. If a supper club isn’t your cup of tea, the area’s taverns are known for some of the best fish fries around, Walsh says. Princeton is home to Wisconsin’s largest weekly outdoor flea market, where tens of thousands of visitors have browsed antiques, trinkets, books, baked goods and more. Ripon (home of the Republican Party), has nice shops and dining as well. Within a 30-minute ride, you can find authentic Amish communities that welcome visitors to their specialty shops full of cheeses, baked goods, handcrafted furniture and more. The stores are run out of the farms of local Amish families. As with Green Lake, the biggest linchpin for Lake Geneva is its largest body of water. Geneva Lake boasts more than 5,000 acres of spring-fed water, and there are four public beaches for visitors to enjoy. You can bring your own boat or rent one, along with paddleboats, Jet Skis and more from various companies around town. However, the Lake Geneva Cruise Line is one of the best ways to enjoy the lake, says Joe Tominaro, director of marketing and communication for Visit Lake Geneva. The cruise line offers narrated tours on its boats while riders enjoy cruises tailored toward cocktails, family-friendly experiences and more. “If you’re here and you don’t get out and enjoy the lake, it’s a shame,” Tominaro says. You can also enjoy the lake by just walking around it. Not only can you traverse short sections of old Potawatomie Indian trails, you can also stroll along the properties of industry barons like the Wrigleys, Maytags and others. Besides its estates, Lake Geneva has many other buildings of historical importance. Hotels like the Baker House, built in 1886, or Maxwell Mansion, built in 1858, are fully restored and offer great adult-only rendezvous. If you’ve got the entire family with you, one of the most stunning shows you can see is at the Tristan Crist Magic Theatre. The Vegas-style show is very intimate – it has only about 50 seats, so you’re a handshake away from the stage, Tominaro says. The illusionist is a highlight. This family-friendly company offers fabulous canopy zip line tours, obstacle courses through the tree canopies and even a 1,200-foot-long racing zip line. Every Thursday evening from July 6 to Aug. 24, enjoy a free two-hour concert at Flat Iron Park. George Williams College of Aurora University hosts Music by the Lake at its shoreline pavilion. 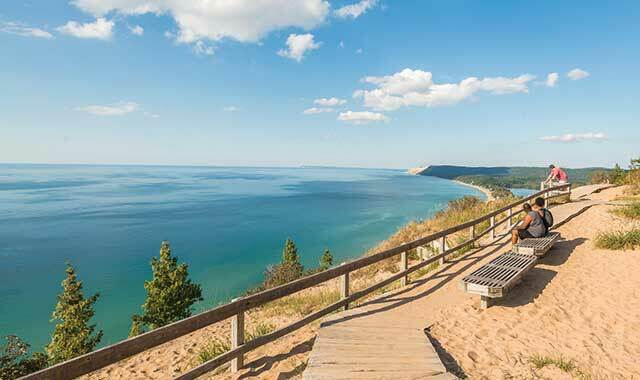 At the top of the list for those visiting Traverse City in the summer is Sleeping Bear Dunes National Lakeshore, which covers a 64-mile-long stretch along Lake Michigan’s eastern coast. Though the dunes are technically a 40-minute drive from Traverse City, it’s an easy morning or afternoon trip. You can easily spend an entire day there, Jenness says. There are hiking and biking trails, ranger-led tours and canoe trips – just for starters. Once you head back into town, the downtown area is full of unique shops, with more than 130 boutiques, galleries and restaurants lining the streets. Speaking of cherries, Traverse City is the cherry capitol of the world. As the country’s largest producer of tart cherries, the city celebrates its heritage with an annual National Cherry Festival, which took place this year from July 1 through 8. If you don’t make the festival, at least visit Cherry Republic. The city’s most popular beach, Clinch Park, is conveniently located right across the road from downtown and offers a brand-new splash park for the kiddos, plus a new restaurant right by the marina. A favorite for lunch, dinner or pick-me-up. The open-air bar is family- and dog-friendly, featuring rotating food trucks, live music and creative libations. Voted “Best Ice Cream in America” by viewers on Good Morning America, this is the place to lick your cone and watch the cows next door. A “must order” dessert is Cherries Moobilee. This entry was posted on Tuesday, July 18th, 2017 at 11:59 am	and is filed under Recreation & Destinations. You can follow any responses to this entry through the RSS 2.0 feed. Both comments and pings are currently closed.